Game Killer APK (or GameKiller) is an android app to modify coins, gems, etc of android games by using technique of memory modifying. Gamekiller has been downloaded by more than 10 million users worldwide making it one of the most downloaded app not available on Google Play store. Game killer is a powerful yet easy to use, supports maximum number of games and is compatible on latest android versions; Lollipop and Marshmallow. You can download Game killer freely without any survey as well as read detailed step-wise procedure on using Game Killer on this site. Warning:- There are many fake sites that are providing download links to modified version of Game killer that contains virus. So, we request you to download from our official site only and share with your friends. Note:– Game killer works only on rooted devices. If your device is not rooted, please root it first with our root app for android. IF YOU DON’T WANT TO ROOT YOUR DEVICE AND STILL WANT TO MODIFY GAMES, PLEASE READ OUR POST LUCKY PATCHER NO ROOT. LUCKY PATCHER IS SIMILAR APP TO GAME KILLER AND WORKS ON NON ROOTED DEVICES TOO. HOW TO HACK GAME SCORES WITH GAME KILLER? Download Game killer from our site. Click Here to download. Open Game Killer. You will see following window. Press back or minimize game killer. Now you will see the game killer icon floating on your screen. Open the game you want to hack and play it. Collect some coins or game score or anything you want to hack. Click on the game killer icon on the top. You will see “Input number to do exact search………”. 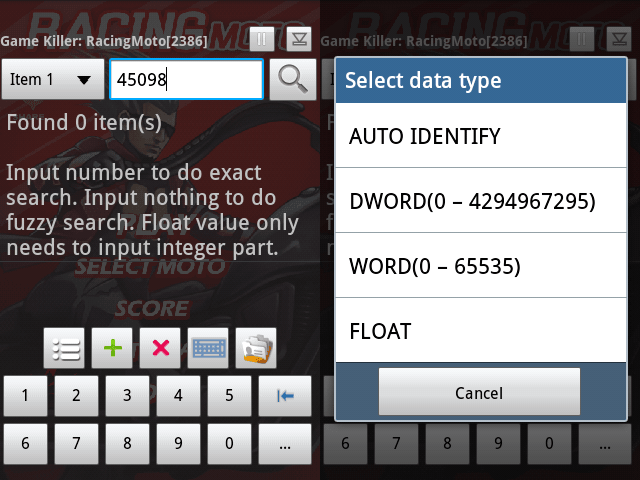 Enter the number of coins or scores or any item from the keyboard. Press search button and tap auto identify in upcoming window. Suppose if you have 1000 coins, enter 1000 from bottom keyword and tap search. If it shows multiple values, play game again, collect more items and search again until it shows single value. After it shows single value, tap on it and change it to any value you want. As in above example, If you enter 99999 now your coins will change from 1000 to 99999. Keep on hacking other items in same way. 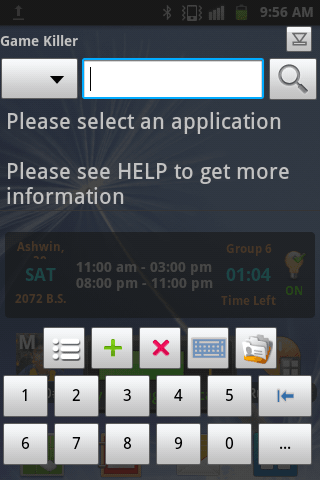 You can try fuzzy search, floating number etc yourself. Trying yourself is the best way of gaining knowledge. Just try everything until you get what you want. It seems quite confusing at first but it is easy after you use for some time. Gamekiller has been updated recently to v4.25. If you are facing problem with this version, you can try using previous version (v3.11). Anyway, the following updates and improvements were done on the latest version of Game killer. Bugs Fixed and much more. Note:- FAQs are regularly updated and are sorted below based on volume of query we receive in descending order. On which Games does Game killer apk work? Currently,(or maybe forever) Game killer works in offline games only. Online games are actually very hard to hack. We have to hack the server of those game which is almost impossible to hack by simply using n android app like Game killer. You need advanced knowledge of Hacking or programming to hack such games. Moreover, whether a game can be hacked or not, depends upon your skill and patience. Some users complain that Gamekiller doesn’t work on a certain game while some other users are hacking the same game easily and sharing their screenshots with us. Think positive and try more, you will obviously succeed. It shows “Installation Blocked” or similar messages while installing. How can I fix it? Go to your device settings>security. Scroll down to find “Unknown sources” and enable it. I cannot download Game killer. What should I do? 1. Change your browser. Sometimes, web browser can cause this issue. Is there any way that I can use Game killer without rooting my android device? No. Rooting your android device is the very first step to use Game killer on your android devices. You can root easily your devices with kingroot. If kingroot doesn’t work on your device, google How to Root [Your device name]. Still I don’t want to root my phone. Are there any alternatives? If you don’t want to root your android but want to hack android games, you can try our another app Lucky Patcher. Lucky Patcher is different than Gamekiller. It works even on non-rooted devices, is easier than Game killer but supports less games. You can read full guide about Lucky patcher here. Will Google Ban me if they found I am using Game killer? Google won’t ban you or they even don’t care whether you are using Gamekiller or not. Moreover, Game killer has built-in anti-detect mechanism that prevent Game developers from getting information about Game killer. Which versions of android does this app support? From Gingerbread (android 2.3) to Marshmallow (android 6.0). But older device may not support latest version. In that case, use older version (3.11). Click Here to download Game killer apk.